I've recently started taking some supplements to help with burning fat and insuring that I am getting enough water each day. I have come across a brand, Mansports, which is keto-friendly and has great products that I have started using throughout the day. Since I get a keto-audience on this blog, I thought it might be valuable to those readers. **I have no relationship with Mansports other than the purchases I have made with my own money. Mansports products are made with zero or at max, a low sugar content. All the products I have been using are zero sugar and have not negatively impacted me staying in ketosis in any way. I have not tried all the products available but have three great products so far that have become part of my normal routine. 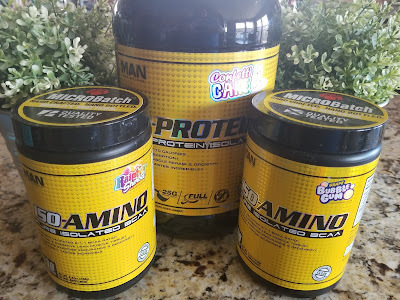 Mansports Iso-Amino. You add a scoop of this to a tall glass of ice water and it has a similar effect as adding Crystal Light to your water but the flavors are over the top good, just like candy. So far I have tried grape bubble gum which legit tastes like grape gum and Rainbow sherbet which I think tastes most like Fruity Pebble Cereal which I still really enjoy. Both help me drink a ton more water and stay hydrated which is also helping with my weight loss. Other flavors that they have and that I am anxious to try are: Pineapple Express, Fruit Smash, Dorks (Nerds-candy flavor), Green Apple and so many other flavors. Mansports L-Carnitine. L-Carnitine is a fat burning booster. I keep this in my refrigerator and take a shot each morning to help me burn more fat throughout the day. L-Carnitine comes in Lemon Drop, Rainbow Sherbet, Blue Razz, and Mango. I am losing weight again. Although I have been back on keto since January my loss has been a lot slower than the past. Once I incorporated these products in, I have started seeing results faster. My sweet tooth is gone. I am not craving sugary-flavored things because my body thinks it is getting this because of the candy and baked good flavors. You can buy Mansports products on their website and they frequently run specials like 20-30% off. This is good because some items can be pricey. Amazon also has a selection of Mansports products but you won't find the variety offered on their website.